For an investor interested in getting exposure to frontier and emerging markets, there are 78 ETFs available which help one invest across the universe. Of these 78 funds, three are focused on frontier markets. These funds are not country-specific but can be sector-focused or thematic. So for broad-based exposure, an investor has a lot of options. But what about single-country exposure? In the previous article, we had presented a graph which plotted the number of ETFs dedicatedly investing into frontier and emerging market countries. 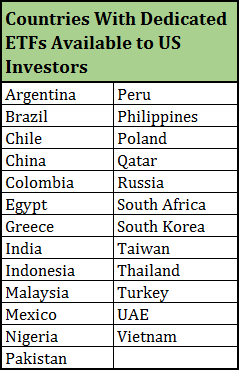 Taking that information, along with a few other numbers, the number of frontier and emerging market countries, not including stand alone countries, which have dedicated ETFs stand at 25. Meanwhile, the total number of countries classified as frontier or emerging (along with standalone countries) by MSCI stands at 57. The graph above provides a breakdown of the 85 ETFs which track these 25 frontier and emerging market countries. For this purpose, we have included sector-focused and thematic funds along with broad based funds investing across market caps. Leveraged funds have also been considered. China well represented, but what about others? 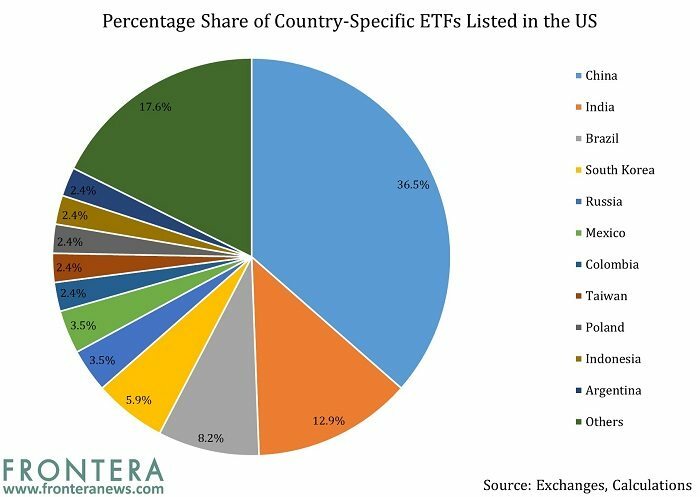 Unsurprisingly, China dominates the list, accounting for 31 ETFs out of the 85 considered for this analysis. India and Brazil are a distant second and third respectively. The top five countries offering the most ETFs available on the US market account for 67% of the total number of single-country ETFs across the frontier and emerging market universe. 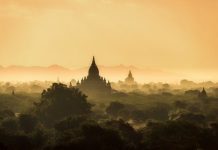 This is broadly similar to the geographic portfolio composition of the three largest emerging market ETFs – the Vanguard FTSE Emerging Markets ETF (VWO), the iShares Core MSCI Emerging Markets ETF (IEMG), and the iShares MSCI Emerging Markets ETF (EEM). The top five countries weigh-in at 70-73% of their portfolios. China is well represented with large-cap funds like iShares China Large-Cap ETF (FXI), small-cap funds like Guggenheim China Small Cap ETF (HAO), all-cap funds like Guggenheim China All-Cap ETF (YAO), currency-hedged funds like Deutsche X-trackers CSI 300 China A-Shares Hedged Equity ETF (ASHX), and funds investing based on investable market indices like SPDR MSCI China A Shares IMI ETF (XINA), apart from sector-based and thematic funds also available for US investors. India and Brazil are also quite well-represented, though they don’t have sector-focused funds dedicated to them. However, most others barely get enough coverage. 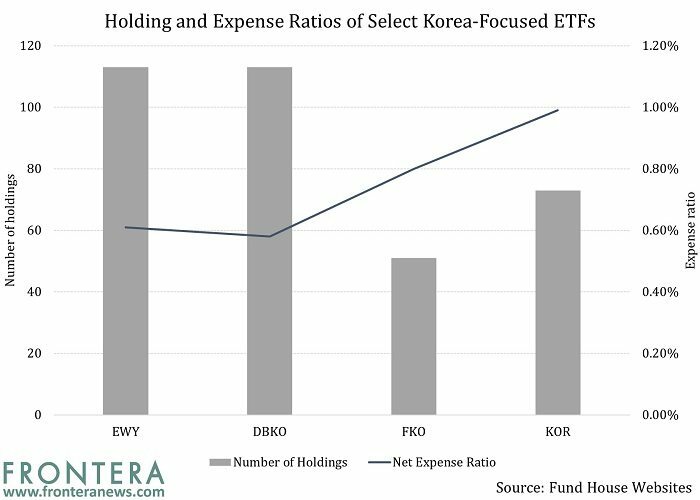 For instance, though South Korea forms nearly 15% of the EEM and IEMG, there are only six funds tracking it, two of which are currency hedged and one is leveraged. Neither the MSCI Korea Index nor the MSCI Korea 25/50 Index invest in small-caps but still cover about 85% of the market. Both are comprised of 112 constituents. There is an MSCI Korea IMI Index, which has 448 constituents and covers about 99% of the Korean equity universe, but no ETF tracks it. There are no sector or thematic funds either. Taiwan is another case in point. Though it forms 12-16% of the assets of EEM, IEMG and VWO, it has only two funds dedicated to it. The MSCI Taiwan 25/50 Index, which is tracked by the bigger of the two funds – the iShares MSCI Taiwan Capped ETF (EWT) – covers about 85% of the free-float market cap with 89 constituents as compared to the MSCI Taiwan IMI Index, which is comprised of 390 stocks and covers about 99% of the market. Further, while South Korea has 46 indices in its home market, Taiwan has 37, according to Bloomberg data. Thus, there may be some opportunity there for sector or thematic coverage. 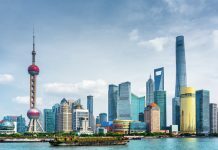 Compared to China, these are certainly smaller markets, and may not require dedicated sector funds, but a more broad-based exposure could be interesting given their diversity and size amid the ex-China emerging markets universe. South Korea and Taiwan are still relatively major markets though. There are many countries which have even lower representation. Let’s look at these in the next article. Previous articleHow Many Country-Specific Frontier And Emerging Markets ETFs Currently Exist?